Of all the aisles of processed foods we’re bombarded with at the typical grocery store, the cereal aisle has to be among the worst. This is an aisle of insanity, plastered with cartoon characters and vivid rainbows of colour with the sole goal of getting kids to harass parents into a purchase. Walking down this aisle means running the gauntlet of millions and millions worth of marketing muscle that only the strongest parents of single-digit-aged kids can withstand. It’s all there, and almost entirely in big, expensive boxes. Chocolate this and strawberry that, all things “frosted”, which of course is code for sugar-coated, and that cartoon cat that has been kicking around for decades and still thinks everything’s grrrrreat. You’ll see the odd parent there, actually reading a nutrition label. They’ll read the label and put the box back and check another one. Then another one and another one, then they grab the Cheerios or All Bran Buds where the sugar per serving is not quite as alarming. Over the past couple of years, I’ve taken a step back to prepare an old school breakfast staple, oatmeal. I’ve only recently rediscovered it after probably not having it since I was a kid. In my mind it was just one of those old things from an earlier age that you remember as being good for you but not terribly good, like mashed turnip or Richard Simmons. Unlike the health guru in the too-short shorts, however, oatmeal is worth another look. With easy preparation the day before, it becomes a breakfast that’s as convenient as any dried cereal, with all the variety of options to keep a kid of any age happy. I typically prepare mine before I go to bed at night, once or twice a week. Over the next couple of months, I’ll be preparing some during one of the six periods of NHL playoff hockey I’ll be consuming on any given evening. In the morning, it’s just a matter of one minute in the microwave, then a topping of milk and some tasty flavourings and breakfast is ready. My favourite oatmeal is spiced with nutmeg and cinnamon, and topped with raisins and sliced almonds. When in season, any fresh berry is great in oatmeal too. Nutritionally it’s a great source of fibre and iron and on its own has no sodium or cholesterol, but mainly I like it because it’s not from a shiny box and it’s really good. I purposefully make it with little sugar so there’s an opportunity to add more to the bowl, either in the form of more sugar, sweet additions such as raisins, or just some maple syrup. The added bonus with oatmeal is that on a per-bowl basis, it costs a fraction of the dried cereal. A $4 bag of steel cut oatmeal lasts many weeks in my house. Another benefit is that, at least in Canada, there’s almost always a fairly local source of oats. You’ll have to run the gauntlet of the health food section to find it. 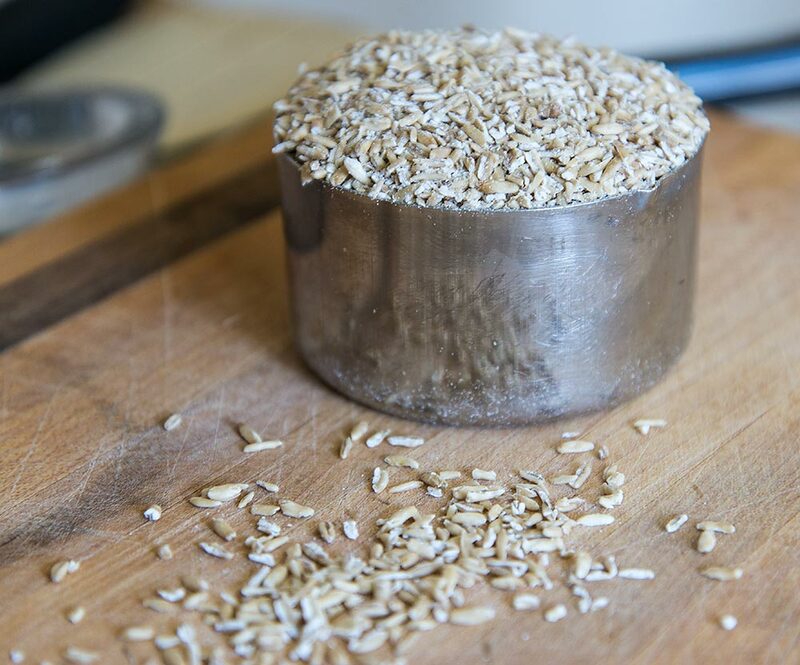 Mix the steel cut oats, water, salt and sugar in a large pot and bring to a boil. Add spices if using as well. As soon as it comes to a boil, reduce heat to low and simmer for 40 minutes, stirring every few minutes to make sure it doesn’t stick to the bottom. Cover and let cool to room temperature (it can just sit on the counter overnight, covered), then place in an air-tight container in the fridge. To serve, spoon ¾ cup of cooked oatmeal into a bowl and microwave for about a minute to heat through. Add milk to thin it out and toppings such as raisins and almonds and extra sugar or maple syrup if desired.